In June 2018, the 9th annual Cedar planting day took place on a nippy Saturday morning. 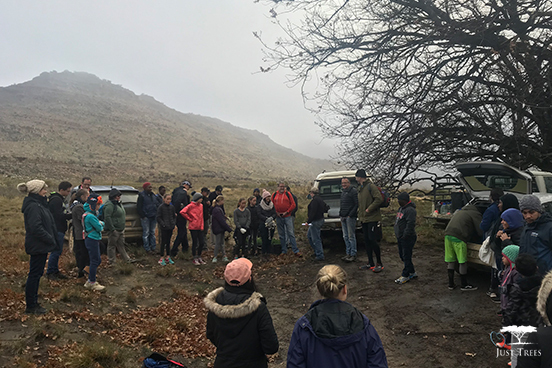 The Just Trees team, along with Cape Nature, spearheaded a group of 80 people, children and adults alike, up a rocky mountain armed with 300 trees and spirits un-phased by the cold of the drizzly weather. The Cedar Restoration Project started back in 2009 with the hopes of reintroducing the tree to the Cederberg region as, despite the town being named after the species, there are very few left in the area. This reduction is the result of a number of factors including felling of the trees, manipulation of the natural veld to stimulate grass growth for livestock grazing as well as wildfires in the area. The Cedar tree is classified as endangered on the global Red Data List but, despite the odds, this initiative is cautiously optimistic that their efforts will prevent this beautiful tree from becoming extinct. Optimism, however, is not the only thing that kept hope alive for the cedar planting teams; a touch of science played a part too! 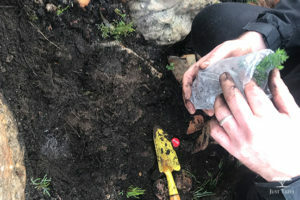 The tree planters were all given a packet of ‘tree drugs’ and a litre of water to assure that the trees planted would go on to grow and live long lives. The combination of Aqua Matrix along with the water provided should give each cedar tree the best possible chance of reaching seed-bearing maturity of 20 years, which is a crucial factor in the restoration process since regeneration of the species depends on seed germination. The Aqua Matrix packet consists of a fusion of potassium-based super absorbent polymer and slow releasing nutrients. The range of Aqua Matrix products are specifically designed to store water and nutrients for slow release on demand. This innovation allows for large quantities of water and nutrients to be readily available for uptake by the root system of a developing plant. It’s particularly useful during times of stress, like in drought, or in the critical period following planting. Since the start of the restoration project Just Trees have planted new cedar trees on the mountain commonly known as Meid se Kop. The chosen area already had established cedar trees growing on it which indicated that the thriving environment could ensure a greater chance of survival for the newly planted trees. Much to our excitement we’ve found that 20-30% of the trees planted over the years have managed to survive in this habitat! As is expected, the planting of 300 trees in one day had participants ravenous toward the end of the project. But once Cape Nature warmed everyone’s cold bodies with delicious veggie soup, vetkoek and roosterkoek the teams could look back at what they had accomplished with a sense of pride. It was an exhausting endeavour and, as it turns out, quite a climb! But nevertheless participants insist that it was well worth the trip! We hope the Cederberg will soon live up to its name once again, thanks to the efforts of the tree-lovers who have taken the time to put back into the earth what had been taken in the past. 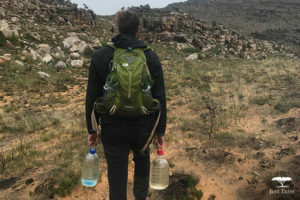 We look forward to many more successful Cederberg trips in the future and if you would like to join in next year or find out how you can contribute to this project, you are welcome to contact Olivia at olivia@justtrees.co.za!